Lastly, I’d like to ask about The Legend of Zelda: Ocarina of Time 3D. 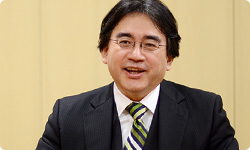 We talked about it in the session of “Iwata Asks” over the Nintendo 3DS system called “Asking Mr. Miyamoto Right Before Release,” but now that it is finished, what do you expect and how do you feel about it? Simply put, I’m really glad we remade it for the Nintendo 3DS system. Earlier, I said that we were able to give Hyrule a kind of warmth or scent in the Nintendo 64 version. Now that it is in stereoscopic 3D, I think we’ve been able to convey the atmosphere even better - thanks to all the hard work that Grezzo19 put in! 19GREZZO Co., Ltd.: A video game developer established in 2006. CEO: Mr. Koichi Ishii. Head office: Tokyo. We also redid a lot of the textures. So it isn’t a simple remake. Right. And it isn’t a port. It is a remake, but in the truest sense of the word. You remade it from scratch. And I think incorporating use of the gyro sensor went quite well. When you use the Fairy Slingshot or the Fairy Bow, the camera switches to Link’s viewpoint. If you use the gyro sensor then, it’s easier to aim. Right. And it feels great to look out over the great plain of Hyrule Field. So I think people who played the game before will be able to play this one comfortably as well. But you move the Nintendo 3DS system when you use the gyro sensor, so the 3D gets a little hard to see. For that reason, when I use the gyro sensor, I’ve been turning the 3D depth slider off. When a demo movie starts or I want to thoroughly enjoy the scenery, I turn it back on. The benefit of the 3D depth slider is you can quickly turn it on and off. Right. It’s really convenient because you can adjust it just by moving the slider up and down. And (Takao) Shimizu-san and those guys worked hard at putting in Hint Movies. It seems like players have often had trouble solving a puzzle and gotten stuck in The Legend of Zelda series. About how many Hint Movies are there? We added more and more until there were more than 130. Yeah. (laughs) A lot of them contain really good hints. I think some people weren’t able to play through to the end of the Nintendo 64 version, so I hope they’ll be able to this time. What do you think about being able to see Hyrule in 3D? He worked really hard on those back then! (laughs) You get a clear sense of the ups and downs of Hyrule Field, and it’s incredibly pleasing just surveying the interior of the Temple of Time. In the Nintendo 64 version, Ganon’s Castle looked bleak at the end, but this time, the 3D really gives it impact. That’s the hardest spot in the game. Yes. In the Nintendo 64 version, it wasn’t easy to take the Iron Boots on and off for walking underneath the water. I think a lot of people had a hard time with that, but with the Touch Screen this time, you can take them on and off in a flash, so it’s no problem. Aonuma-san’s longstanding regret has finally been removed! (laughs) Also, the items are now always visible on the bottom screen. A lot of girls played the original game. Many of them were fans of Link. Yeah. The graphics are even better this time, so Link is even more handsome - just the way Koizumi-san’s wife likes! My biggest hope is that Link will gain more fans through this game. Thank you. One more thing before we finish. Please tell me about the twenty-fifth anniversary of The Legend of Zelda. Sure. Last year, for the twenty-fifth anniversary of Super Mario Bros., we did a number of special things, like make the Super Mario All-Stars Limited Edition package.20 This year is the twenty-fifth anniversary of The Legend of Zelda, but we thought making a similar special commemorative package - only green for The Legend of Zelda - wouldn’t be anything new. 20Super Mario All-Stars Limited Edition package: A video game compilation released for the Wii console in Japan in October 2010 to commemorate the twenty-fifth anniversary of Super Mario Bros. The game includes four early Super Mario Bros. games, as well as a commemorative booklet and soundtrack CD. NOA (Nintendo of America) did suggest a special The Legend of Zelda package. Yes. But doing the same thing two years in a row isn’t very like Nintendo. That’s right. You and I both responded that way to that idea in separate discussions. Yes. It may just be an arbitrary restraint, but it’s no fun if you don’t do something new. So I thought over a number of ideas. The first orchestral music for a game I worked on was for The Legend of Zelda. Right. For The Legend of Zelda: Twilight Princess.21 21The Legend of Zelda: Twilight Princess: An action-adventure game released for the Wii console and the Nintendo GameCube system in Japan in December 2006. Yes. And The Legend of Zelda: Skyward Sword has more orchestral songs than any other game in the series. So - as already announced at E3 - we’re going to hold The Legend of Zelda twenty-fifth anniversary orchestral concerts in Japan, America and Europe. Japan’s will be held on October 10, which is National Sports Day, in Tokyo at Sumida Triphony Hall. 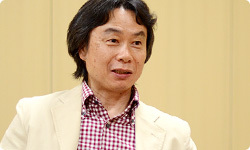 The Tokyo Philharmonic Orchestra will perform, with Mr. Taizo Takemoto22 conducting. (Editor’s Note: Only the concert date for Japan has been announced at the time of this interview. Concert schedule for other regions is still TBD.) 22Mr. Taizo Takemoto: A conductor active in a broad variety of genres, mainly classical music, but also including movie music and video game music. Lastly, I’d like to ask about The Legend of Zelda: Ocarina of Time 3D. 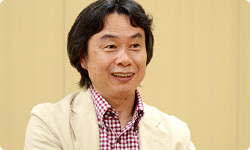 We talked about it in the session of “Iwata Asks” over the Nintendo 3DS system called “Asking Mr.
the orchestral music in the Super Mario Galaxy and Super Mario Galaxy 224 games . 23Super Smash Bros. DX Orchestra Concert: An event hosted by Nintendo and HAL Laboratory in Tokyo in August 2002. 24Super Mario Galaxy and Super Mario Galaxy 2: Both are 3D action games released for the Wii console in Japan in November 2007 and May 2010, respectively. Right. There will only be one in Japan, so not everyone will be able to attend. But we want as many people as possible to enjoy the music of The Legend of Zelda, so we’re thinking about making a CD of the concert music. We actually have plans for two CDs. Yes. One is the original soundtrack CD as a present for anyone who purchases The Legend of Zelda: Ocarina of Time 3D and registers the game with Club Nintendo by July 31. (Editor’s note: In Europe, this promotion ended on June 30th) And the other is a CD featuring a recording of The Legend of Zelda 25th Anniversary Symphony Concert. Nintendo will announce how it plans to release it at a later date. So the twenty-fifth anniversary of The Legend of Zelda will revolve around music. Yes. And we plan for players to enjoy playing several The Legend of Zelda titles this year to commemorate the twenty-fifth anniversary, including The Legend of Zelda: Ocarina of Time 3D; The Legend of Zelda: Skyward Sword, scheduled for release this year; the virtual console version of The Legend of Zelda: Link's Awakening DX, which was made available for download from Nintendo eShop on June 8 and The Legend of Zelda: Four Swords25, scheduled to be free to download as Nintendo DSiWare from September. 25The Legend of Zelda: Four Swords: Released for the Game Boy Advance system in Japan in March 2003 on a cartridge together with a modified version of The Legend of Zelda: A Link to the Past. This is the year of The Legend of Zelda. That’s right. But not just of The Legend of Zelda. We’re also making a new Super Mario Bros. game for the Nintendo 3DS system, so I hope everyone will be on the lookout!